We have a joke in my family since we were kids about bathing. It makes no sense to anyone but us (totally an inside joke). My brother, Mark to this day loves to mock me when I take a bath. He says, "You can't get clean." I so beg to differ with him on this, I can get clean and I'm on my way to get clean. I'll be clean from head to toe and while I relax my brain is going to rid itself sludge too. Suffice it to say I know what Mark means, because as soon as you get out the tub the cooties jump back on you. But that's another story I can talk about later. In the meantime all of you have warm and wet bubbly dreams of getting to a peaceful place of restoration in your bath or shower, Take your time with it and believe me you will get clean. PS. I would be hard pressed to leave this sanctuary. I'll keep dreaming till the dream comes. 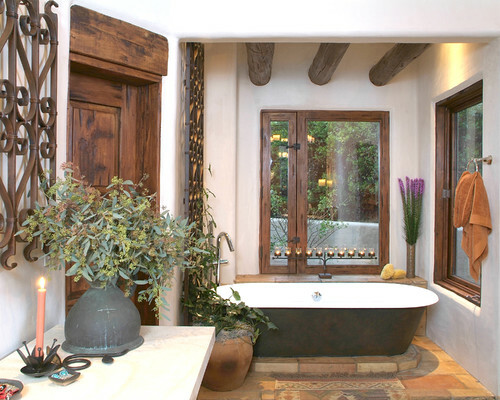 Traditional Bathroom by Carlsbad Interior Designers & Decorators Hamilton-Gray Design, Inc.
Can you feel the (My) love? Y'all,, Sista-girl ain't had much sleep at all, but here's what...I'm tired from cooking and cleaning and washing and ironin'. Lol! Just wanna relax and take some time away from what bothers me. Confused a bit about...? Definitely need to sleep, but probably won't. I love what I'm doing, but it is scary with every hat I have to wear at this venture. There are opportunities to evolving and a purpose intended I have to fulfill. I am consciousness of what is happening. I agree with it. It's driving me, not me it. I'm saying "slow down." I'm so Duhduhduh! right now; so tired. Haha! This, if not my first video is one of the first. Can you feel the/my love? God is so good! Yes he is! Everyone have a peaceful rest and bear with me while I lean to do what is that I must do. Love and peace in the middle and everywhere else. "Good" humor is the best medicine. I've been real busy working to get the site up and arrange my affairs to get legit. I'm still building on the stock needed to prepare for launch. I thought I'd post just because it's cathartic for me to release this energy so I can get some sleep. Anyway, I conducted a survey to get a feel how "Gorda," as a name for my soap will be received on market. I, of course, like the name for so many reasons (it's all in my head cooking up ideas), I think it's market savvy if I can convey what soap is and "why"??? my soap is "FAT." Haha! I feel it perfectly conveys what my product is. I'm holding on at least till survey comes in. Gorda (f) is derived from the Spanish word for "fat" or "well-fed"
(affective) Honey ¿Vamos al cine gordo? Can we go to the movie, honey? Gorda = FAT, "PHAT! ", large, big, plump (implied) ... Hey how about this, "Grand Prize in the Lottery!" Soap is fat (mostly). And so is the size of my bars (8 oz/227 g is big!). Did you know Irish Spring wasn't a source of water before someone told you it was a bar of soap? Advertising and marketing is about getting into the consumer's head to influence by providing information the consumer wants to hear, but advertising teaches in the way of persuasion. I did some research off the cuff and came up with Bliss' "FATGIRL" soap line. They sell through Sephoria and other high-end venues. A well received product by a catchy name. So you think that doesn't inspire me? Another company, Big Fat Soap also takes pride in fat and is their claim to fame. If I am to follow anyone in the business I think I'd follow someone who has been there, has done the homework and is successfully doing "it." Caution: Take it all in, but know the final decision will be yours. Hard work. Other than researching I did soap a restock of Lemon-Lavender-Rosemary soap and cut it yesterday. Today I stamped the bars and set them up to cure. Gotta take some pics and post. I need to package the soaps that have cured to have ready for sell. In the meantime I should get some rest, so I'll say good night.